Wouldn’t you feel more comfortable if you could easily pronounce all the ingredients of the maintenance chemicals going in your pool? Better yet, what if you knew they were all non-toxic, non-irritating, and environmentally friendly? Natural Chemistry provides you with these luxuries, along with Eagle Pool & Spa’s efficiency stamp of approval – this stuff really works! Natural Chemistry products utilize enzymes’ ability to bind to and separate molecules, causing the break down of organic material in water. While this process is not exclusive to Natural Chemistry products, the use of a broad-spectrum enzyme is. Enzymes used by other companies only break down fats and oils – the most common residuals left in water from sunscreen, sweat and beauty products. The broad-spectrum enzyme is powerful enough to break down organic waste that naturally develops in water, preventing the major cause of filter overload before it even starts. This process works independently of your usual sanitizer, allowing chemicals such as chlorine or bromine to work most efficiently. Using our our good friend, the F.R.O.G. system? No problem! Going the traditional route with regular old chlorine tabs? 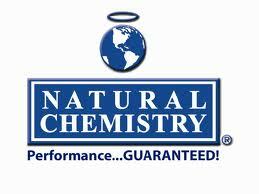 Natural Chemistry is compatible with any form of sanitation. Now not everyone likes to take the proactive approach, and that’s okay! If you’d rather clean afterwards than prevent messes before they start, bless your lazy heart. But let me ask you this – have you ever had the issue of being unable to gain a chlorine level? And I don’t just mean in the dead heat of summer, with people in and out all day using up the chlorine. I’m talking about when a heavy dose of shock still reads absolutely nil on the test strip. This issue is likely the result of built up dirt and sludge in the plumbing of the (in-ground) pool. The chlorine is used up on this gunk before it even has a chance to benefit the water in your pool. Natural Chemistry’s Purge chemical will clean all the areas that you can’t, leaving your pump and filter system in a much healthier and efficient state. A wide array of Natural Chemistry products can be found at our Eagleville and Pottstown locations, and our knowledgeable retail staff is ready to inform you of the purpose and application of each and every one. The season is upon us, see you soon with that start-up water test!